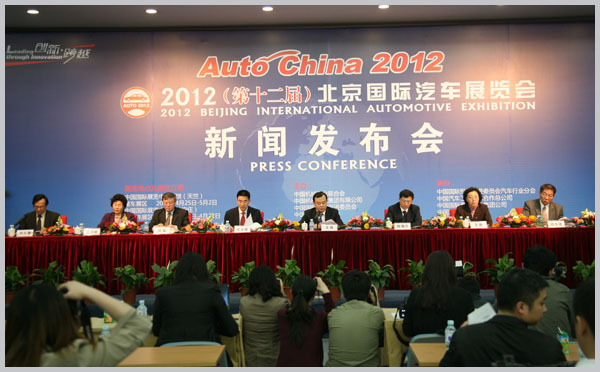 The press conference of 2012 12th China International Automotive Exhibition was grandly held in Beijing International Exhibition Center in the afternoon of April 9. President of CCPIT Auto, Secretary General of Auto China SecretariatWang Xia, CNAICO President Ji Xuecheng, Vice President of CIEC Yin Haixing, Secretary General of SAE-China Hanlei, DeputySecretaryGeneralof CAAM Zhi Min, Consultant of CCPIT Auto Ai Shuyuan attended the conference. CNAICO Vice President Jing Yongjian, Wen Yimei and nearly 200 media attended too. With the theme of "leading of innovation”, Auto China will be held from April 25, 2012 to May 2 in Beijing China International Exhibition Center. The total exhibition area of Auto China is 230,000㎡which set a new record in history. There were 2,000 companies from 14 countries and regions participated, estimated 1125 vehicles, 120 world debut cars would be exhibited, including 36 world debut cars, and 35 Asia debut cars from multinational companies, 74 concept cars, 88 new energy cars. Compared with previous years, the commercial vehicle and auto parts exhibition area presented many new features this year. Commercial vehicles exhibited in the south square of the new China International Exhibition Center this year, which is the most ambitious commercial vehicles exhibition area in the history of Auto China. Nearly 30 commercial vehicles companies displayed their latest products. Based on the development prospect of commercial vehicle market, President Ji XueCheng answered the journalists that since the lack of a professional commercial vehicle exhibition in domestic, CNAICO as a professional auto exhibition company in China, would go a long way in this respect. Accord with the theme of this show, area also showed the leading of innovation. The exhibitors paid more attention to the effect of brand publicity, the overall image and scale of booth. The auto parts exhibition this year was not restricted to after-market service display, and will provide good opportunities for vehicle manufacturers to look for good matching parts supply partners. The show made great improvement and innovation in exhibition services, news propaganda, meeting organization and cultural activities, which provided necessary foundation to secure the successful of the show. Auto China was hosted by CMIF, SINOMACH, CCPIT and CAAM, organized by CCPIT Auto, CNAICO, CIEC, SAE-China, overseas co-organized by Hongkong Adsale Exhibition Services Ltd, Messe Munchen International Expo Group, IMAG International Trade Fair & Exhibition Co., Ltd.